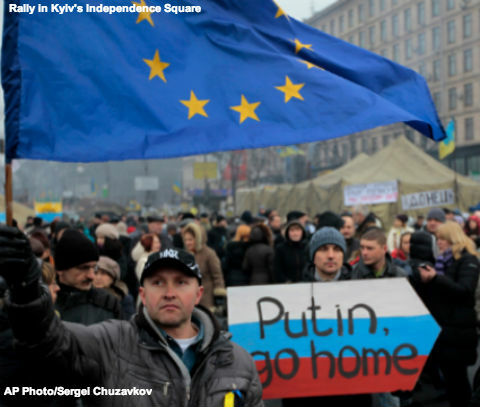 Kiev is no more interested in the desires of Crimea’s people. Although Ukraine enthusiastically seceded from the Soviet Union, the new state does not want its own people to leave. The West proclaimed itself shocked at Moscow’s move, even though the former routinely intervenes militarily for its own ends. Moreover, Washington and Brussels contributed to the current crisis by using the violent protests against former president Viktor Yanukovich to push for a new, Western-oriented government. The biggest losers are Crimeans who prefer Ukraine’s inefficient and corrupt, but still functioning—at least until the violent overthrow of the elected government—democracy to Putin’s wealthier but increasingly authoritarian wannabe empire. Although ethnic Russians make up a majority of Crimea’s population, even some of them might have preferred to deal with Moscow from afar. Ethnic minorities have more reason to worry about their future under new rulers. Since the end of the Cold War the West has pursued its version of the notorious Brezhnev Doctrine: What’s mine is mine and what’s yours is negotiable. The U.S. and Europe advanced NATO to Russia’s borders, poured money into Ukraine to promote pro-Western candidates, pressed Kiev to choose between Russia and the European Union, and pushed friendly politicians toward power after the ejection of Russia-friendly Yanukovich. Given Russia’s brazen misbehavior, the West should take measured steps to impose some costs on the regime and its supporters. U.S. and allied officials need to play the long game, finding ways to help encourage moderation in Russia. Washington and its European friends also should avoid triggering a serious cool war. Maintaining at least correct relations with Moscow is necessary to protect U.S. interests elsewhere. Equally important, Washington and Brussels should be more cautious before again undermining important Russian interests next door to the angry bear. From America’s standpoint, whose flag flies over Crimea today is irrelevant. But the revival of nationalism backed by military intervention sets an ominous precedent. The allies still are reaping the whirlwind from the nationalist winds sown by the Versailles Treaty nearly a century ago.